Stand with your exercise ball directly in front of you with your shoulders at 90 degrees. Maintain active transversus abdominus and a neutral lumbar posture. Rotate your upper body and pull the exercise ball to the side as with a golf swing. Rotate back and return to the starting position. Quadriceps, glutes, trunk rotators including abdominal obliques. To avoid back injury, keep the rotation slow and controlled rather than ballistic. To avoid knee injury, don't let your weight bearing knee move ahead of your foot, and keep it centred over your second toe. 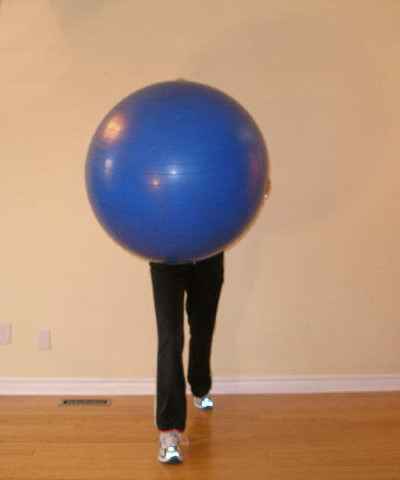 This is a particularly good exercise ball exercise for golfers to generate increased power to the golf swing. Wrap an exercise band around the ball and tie it in a door frame to add resistance. Put your forward foot on a folded up towel, mat, or BOSU for an added challenge. Repeat this exercise ball exercise 6 times on each side. 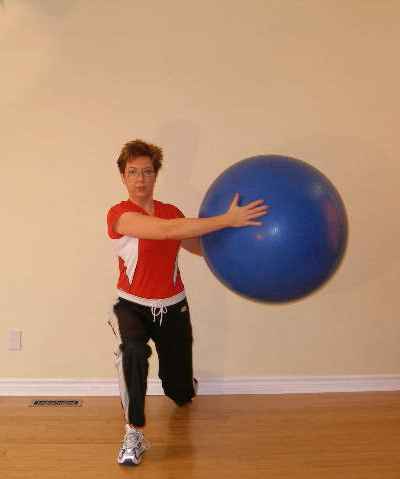 Repeat this exercise ball exercise 15 times on each side.